Our Guinness Extra Stout Beer Soap has a wonderful clean scent of oak, honey and vanilla with the slightest touch of chocolate. It's a great smelling soap that both men and women find very appealing. Beer soap does not smell like beer but instead picks up the aromas of the hops, grains, malt, and extracts used in making the beer. Since beer is primarily hops, the properties and benefits of this herb become part of the soap. Hops are known to sooth irritated skin and contain skin softening amino acids. Takes relaxing to a whole different level doesn't it? Our beer soap creates lots of creamy, foamy bubbles and is great for your skin. Turn your favorite beer drinker into a shower lager meister. Simple Ingredients, Extraordinary Benefits: Cold-process soap handmade with moisturizing oils you and your skin will love ~ saponified olive, palm kernal, cocoa butter, shea butter, sunflower and coconut oils, Guinness Extra Stout Beer, cocoa powder, scent. Ah beer. It makes a great drink, a tangy marinade and a great soap. Yes, soap! Our Irish Red Beer soap creates lots of creamy, foamy bubbles and is great for your skin. The scent combines the aroma of Irish Red, with a lemon twist! It's best described as a fresh, citrus with juniper berries and woodsy notes of vetiver. The scent alone makes it a great bar to bathe with, and with the added benefits of the Red Australizn Clay, you can't go wrong. Turn your favorite beer drinker into a shower lager meister. Simple Ingredients, Extraordinary Benefits: Cold-process soap handmade with moisturizing oils you and your skin will love ~ saponified olive, palm kernal, cocoa butter, shea butter, sunflower and coconut oils, Killan's irish red beer, red clay, scent. Made with three clays for the perfect shaving soap; Bentonite, Kaolin and Red Australian Clays. These mineral clays put a soothing layer between your skin and the razor. 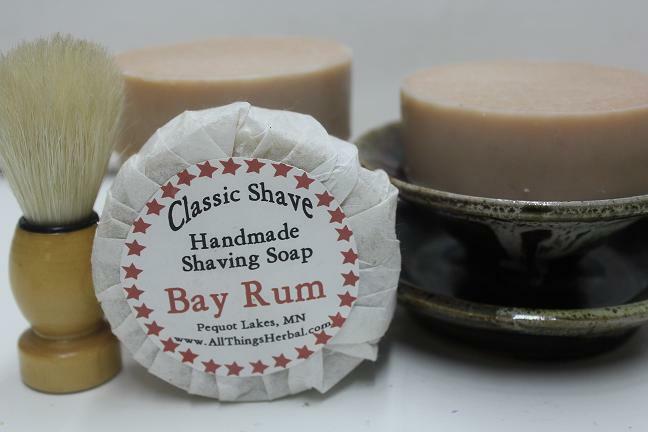 The scent of bay leaves with a touch of crisp pine needles and sweet orange oil. This is a lighter scent than some of our others. Simple Ingredients, Extraordinary Benefits: Cold-process soap handmade with moisturizing oils you and your skin will love ~ saponified olive, palm, soybean, cocoa butter, shea butter, sunflower and coconut oils, bay rum, pine, orange, fir, cedar and patchouli), bentonite, kaolin and red australian clays. 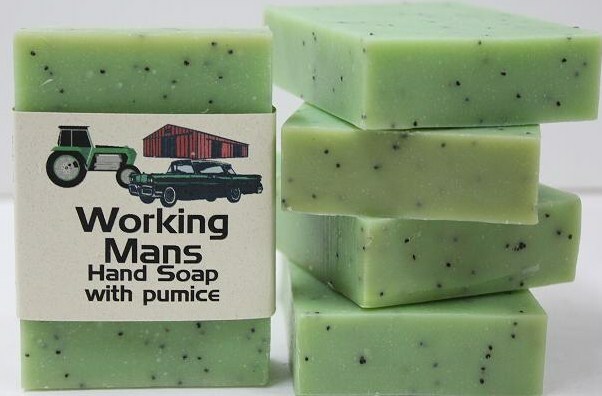 Our spearmint and fresh lemon Working Mans Soap was created to clean soiled and hard worked skin. Super-fatted with cocoa butter to soothe and protect hands. Finely ground pumice, cornmeal and poppy seeds scrub working hands clean. Simple Ingredients, Extraordinary Benefits: Cold-process soap handmade with moisturizing oils you and your skin will love ~ saponified olive, palm, soybean, cocoa butter, shea butter, sunflower and coconut oils, poppy seeds, ground cornmeal and pumice, peppermint, lemon and pine essential oils. Oil of Anise is considered one of the "Old-time Secrets" used by fisherman to improve their catch. We've taken Anise and our special blend of oils to create a soap that cleans your hands and helps eliminate human odors that can transfer to your lure when handling them. Try washing tackle with this soap - it cleans and coats your lure with the scent of Anise making it more attractive to all fish. Simple Ingredients, Extraordinary Benefits: Cold-process soap handmade with moisturizing oils you and your skin will love ~ saponified olive, palm, soybean, cocoa butter, shea butter, sunflower and coconut oils, ground flax seeds, ground coffee beans, anise essential oil. 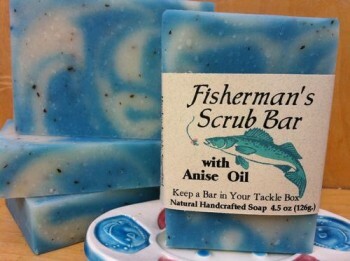 Fishermans Scrub Bar with Anise Oil - Keep a bar in your tackle box. 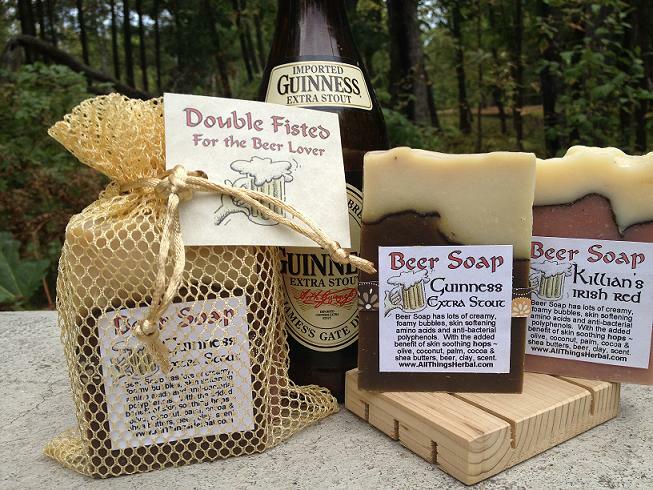 Each Double Fisted Gift Set contains 1 bar of Guinness Beer Soap AND 1 bar of Killian's Irish Red Beer Soap. Our beer soaps create lots of creamy, foamy bubbles and are great for your skin. Enjoy giving these two great beer soaps tucked inside a gold fishnet bag, tagged and ready for gift giving! Bottom's up! 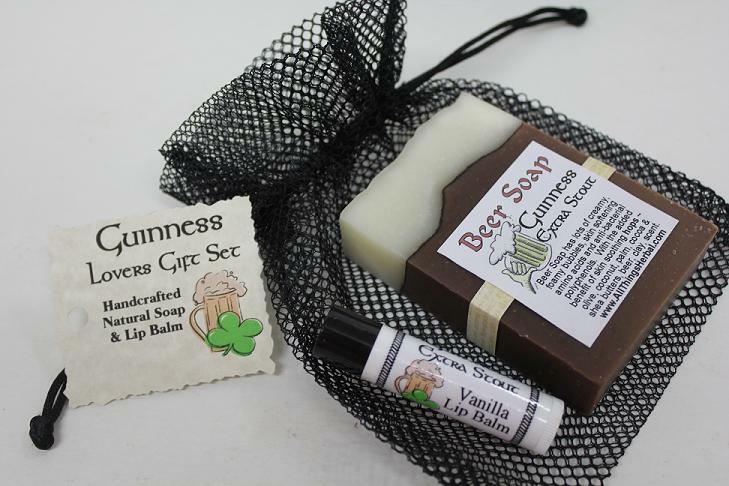 This gift set includes one bar of our Guinness Extra Stout Beer Soap PLUS one Guinness Extra Stout Vanilla Lip Balm tucked together in a black fishnet gift bag - labeled and all ready for gift giving. Makes an awesome gift for weddings, bridesmaids, groomsmen, or just birthdays, anniversaries, or the holidays. Lather responsibly....our 4.5 oz. 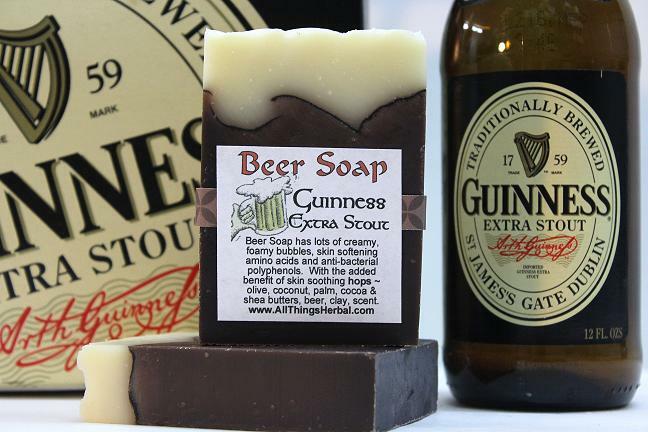 beer soap creates lots of creamy, foamy bubbles and the aroma of Guinness Extra Stout, with a vanilla twist. Our Guinness Extra Stout lip balm will bring a smile to anyone's lips. Creamy cocoa and shea butters are fantastic for your lips, and the dark vanilla flavor complements an Irish Guinness nicely. 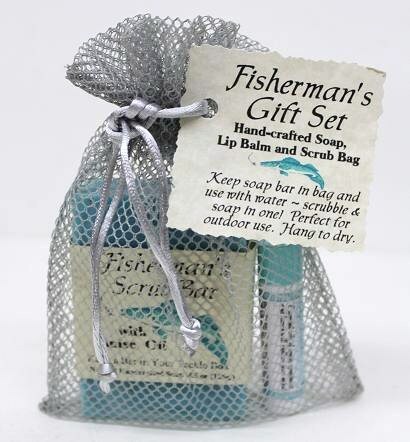 Tucked inside this silver fishnet gift bag is a bar of our Anise Fisherman's Scrub Soap PLUS one Anise & Peppermint Lip Balm - tagged and all ready for gift giving. Keep the bar inside the fishnet bag and use as a scrubby. Then, just hang to air dry. Protect your lips while fishing or any time you are enjoying the outdoors. Our Lip Balm glides on, is moisturing and lightly scented with essential oils of Anise and Peppermint. Copyright © 2019 All Things Herbal Limited - Handcrafted Natural Soap. All Rights Reserved.